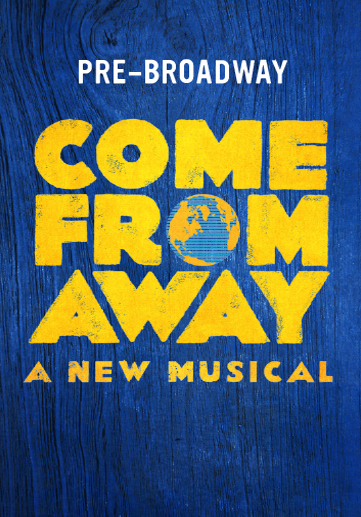 Tonight Teena and I saw Come From Away at the Royal Alexandra Theatre. This is the first show since the theatre underwent renovations and restoration this summer. The seats are now wider and more comfortable, there plus there seems to be more leg room. Everything has this fresh, bright newness about it, throughout this historic 109 year old building. I was quite impressed. Now on to the play. This is the final stop before it goes to Broadway. Performances there start on February 18, 2017 with opening night being on March 12. The play is fabulous! As Teena and I were leaving, I said to her that this is one of the best plays that I have ever seen. She laughed and said she was about to saw the same thing to me. Many things make this play what it is and perhaps mostly is that all the stories are true. They don't end the way a writer decides they should end but end they way they actually did. The twelve actors on the stage were fabulous, playing citizens and officials of Gander trying to deal with the chaos of their town suddenly doubling in size in a moment and without warning. They also play multiple other roles throughout the play. In the cast listing, their roles are listed with their Gander names first followed by "& others", such as Joel Hatch playing "Claude & others". Much of the success of the play is due to the work of Joel Goldes, who is the Dialect Coach. The Newfoundland accent was well done by all the cast, who had to slide from one dialect to another throughout. Lee MacDougal, for instance, was British, American and a Newfoundlander. It was funny, sad and dramatic and should it come back to Toronto, I would go see it again. I'm looking forward to hearing how well and what awards it wins when it reaches Broadway.